Messermeister Archives - J.D. Honigberg International, Inc. When it comes to world class knives and tools, Messermeister sits a cut above the rest. Utilizing the industry’s finest materials, each knife is hand crafted by a Solingen, Germany knife master. 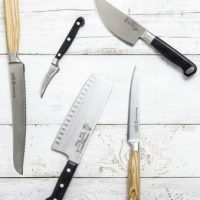 A favorite of the world’s top chefs, collectors and enthusiasts, each blade is hot drop hammer forged, the traditional way. The German high carbon stainless steel alloy is then ground and reground, and finished with an extremely sharp polished edge. 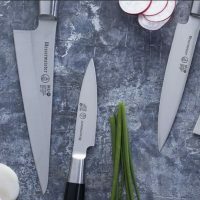 With a name that literally translates to “Knife Master”, it’s no wonder they have been dominating the culinary world ever since Bernd Dressler founded the company in 1981. Messermeister’s Knife for Life™ Guarantee provides a Lifetime Warranty against material and manufacturing defects— ensuring these premium chef knives can be passed down for generations to come.